It's is the creation of artist Josie Martin. 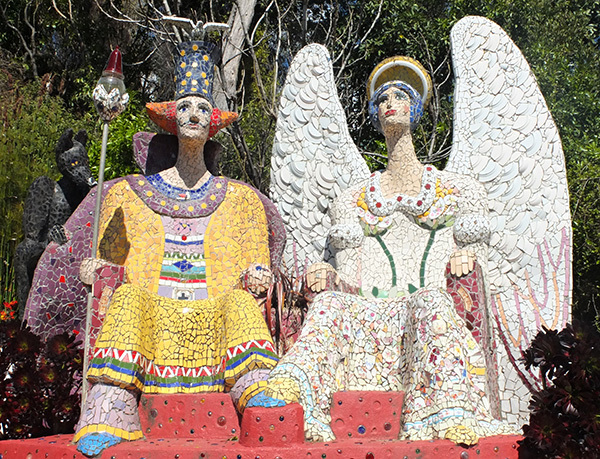 She has other pieces of art displayed throughout her garden, but the mosaics are my favourite. There are so many! Too many? Let's just say this is not the garden of a minimalist. I can't remember being so amazed, entertained, thought-provoked, etc. ever before in someone else's garden. How vibrant and clever the artist is. No, more than clever, scarily creative, with swirling colours, not afraid to throw in oodles of whimsy. I'm overwhelmed by a towering dancing woman, the bottom of her skirt level with my eyes. Then I notice the beautifully delicate patterns around her hemline. I walk past a seated blushing beauty - her cheeks are floral crockery, with the tiniest blush-pink flowers. This continual 'toggling' of scale, from the big grand view to the tiniest little treasure, is so enjoyable. 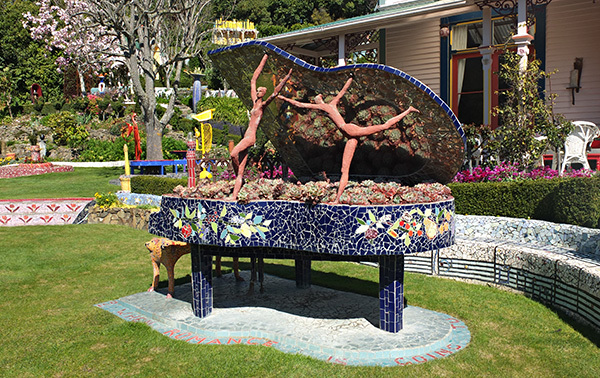 It's the essence of great garden design, after all, and this is an artist's garden. I love it.